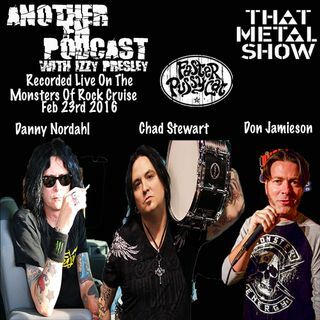 Recorded live on the Monsters Of Rock Cruise "Shredders From The Deep" on February 23rd, 2016, I feebly attempt to do the impossible - Interview Danny Nordahl from Faster Pussycat in front of a live audience. There is no interview, it's just Danny being Danny and it is pure hilarity. After he rips on his drummer, Chad Stewart, Chad comes in with Danny and Don Jamieson (That Metal Show), and a pure shitshow ensues. They rip on everybody from Stryper to Eddie Trunk. I ... Más informaciones can't even sum this one up. Just listen, because it is comedy gold.